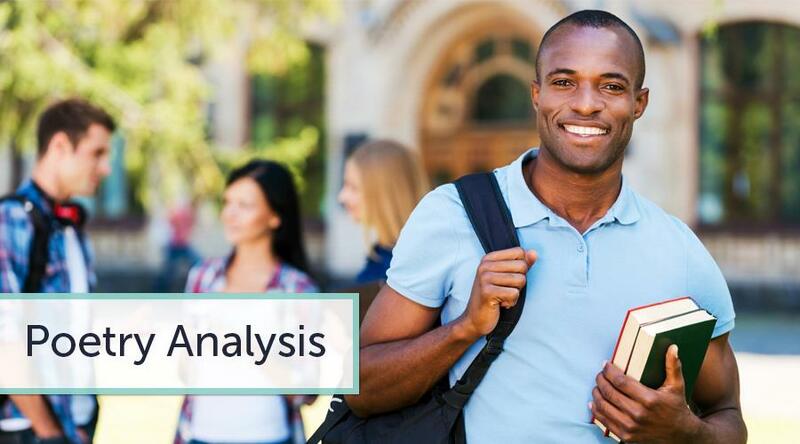 If you do not know how to write a poetry analysis essay, read our writing guide to discover some useful tips for poetry analysis. Poetry analysis is a popular academic assignment in colleges and universities. In essence, a poetry analysis is an academic work, in which you critically review a poem, analyze its literary significance, structure, imagery, meaning, language, and other components. In poetry analysis assignment, you cannot limit yourself to simply analyzing the wording and language structures used by the poet. You must develop a broader picture of your chosen poem against the context, in which it was written. You should relate the meaning of the poem to the historical period, in which it was created. You should also be ready to conduct some external research to support your claims. Explore how the poem came to life and how it influenced world poetry. Fulfilment of poetry analysis assignment begins with a thorough reading of the poem. Read the selected poem several times. What do you feel? What is your first impression? Answer these questions honestly. Write down your thoughts. Explore the poet's biography and the history of the poem itself. One of the best things you can do in poetry analysis is find out why the poem was written and what it was that the poet wanted to convey with its help. Is it that the poet incorporated his personal experiences into the poem? Now re-read the poem. This is when you should consider the language and wording of your selected poem. Pay attention to imagery and literary devices used in it. In your introduction to poetry analysis, provide sufficient background information. Include a brief review of the poem story, the key characters involved (if any), the context and setting, etc. You should tell your reader what exactly happened in the poem and what message the poet sought to share with his readers. Answer the basic poetry analysis questions such as "where? ", "when? ", and "how?" When the introduction is finished, switch to the analysis of the language and stylistic structure of your chosen poem. Include a review of the meter, rhyme, poetic figures, imagery, metaphors, allegories, comparisons, irony, etc. Finally, try to see any philosophy behind the poem. Include your personal response to it. What do you think? Do you think the poet was skillful at using imagery, irony, and setting to convey his or her message to the audience? Why or why not? Finally, include some concluding remarks. Tell your reader whether you like the poem and why. Include some recommendations for further analysis. There is a long list of poetry essay topics that the students can use for their assignments, and we have selected the top 20. What is the history of poetic methods? Why did the people develop a new method of expressing their emotions and feelings in writing? How can we define the genuine aim of poetry? Can poetry change the mental state of a person? Are there any exact methods of differentiating between good and bad poetry? Can poetry serve as a measurement of personal intelligence? Have a look at some great poetry essay example to see how a topic influences the style of writing. Analyze the approaches needed and choose the best writing techniques. What would be the consequences of illegality of poetry? Is the development of new forms of poetry possible now? How would you define a genuine poet? What would be his or her perfect lifestyle? How can society benefit from the value of poetry? Can there be special places for poetry as a form of art, like the galleries are for the paintings? It is not easy to choose one of the poetry research paper topics, but this choice should be done on the basis of personal interests and passions. How are the great poets set apart from the others? What made them legendary figures in history? Is it possible to define a poem? How can a reader differentiate between a low quality and excellent poem? Can anybody create an outstanding poem? Is it reasonable to study poetic speech at school as a specific subject? A nice poetry essay example can help you see how to work on such an assignment effectively. What are the benefits of poetry to the universe? Who is the most influential poet of all times? Compare and contrast portraying the relationships in two poems. How do the readers perceive the tragic poems? Try to create an impressive poetry essay example yourself, using the topic you really like.